5 to 7 inch Orchid shaped "double". White petals with pink base petals. Look closely. 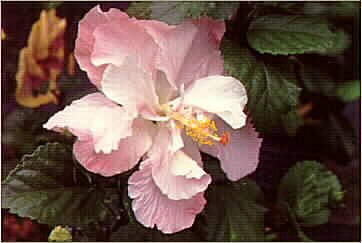 Is it a Hibiscus or an Orchid? Delicate beauty. Vigorous growing plant. EVERY time Nanette Peach flowers, her shape changes ever so slightly but she always looks like herself...maybe that's why so many flowers are named after ladies! Notice that the pinks and whites are different on each flower.